These days, our newspapers and smartphone feeds are filled with critical essays on The Border Wall or The Muslim Ban. Although many of these reactions are filled with shock and dismay, this is far from the first time our country has had a problematic immigration policy. It has been well over a century since the impending Yellow Peril pushed implementation of a policy that banned the immigration of Chinese laborers, known as the Chinese Exclusion Act. However, that is not what we are focusing on today. What we are focusing on is what one would think to be an easy trek into the United States of America: The U.S. Territory of the Philippines. The bolded word only foreshadows the ways in which this story transformed into a saga. Sixta (pictured below) and Juan Urbano, born in 1898 and 1894, respectively, were a married couple and citizens of the Philippines. They had four children. Wanting more for them, they decided to move to the U.S. for their children’s education. On March 28, 1927, the Urbano clan crossed into the United States through the Port of Seattle with ease. At this time, the Philippines was a territory of the United States and Filipinos could enter the country freely with no restrictions. This meant it was a prime opportunity for Sixta, Juan, and their children to make new lives for themselves in America. Soon after immigrating, the children entered school, and their parents were eager to start working. 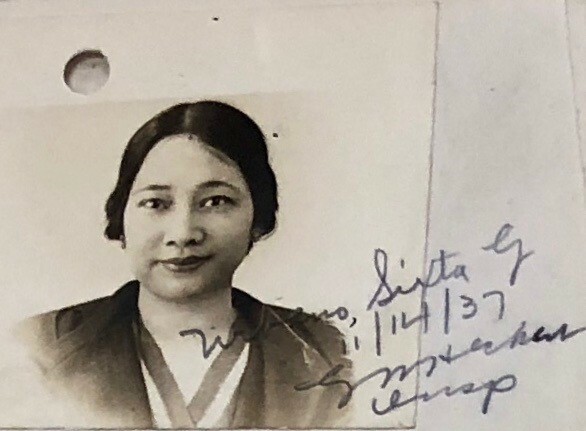 Sixta used her background and connections to sell Filipino goods like jewelry. Once she racked up enough income, she even started her own restaurant at 1865 Post Street in modern-day Japantown, San Francisco. Juan, on the other hand, had an alternative idea in mind. He was an inventor ready to live his own American Dream. This was the reason behind his choice of a non-immigrant visa: a visitor of business. His invention you might ask? The electric pencil (pictured below). Unfortunately, the Great Depression soon hit, and the electric pencil did not have a strong enough following to support Juan and his family. The Depression pushed Juan to return to the Philippines. He thought he might have a better time supporting his family if he could actually make money. He ended up living in his home country for a total of six years. When Juan wanted to come back to the U.S. in 1937, things had changed. In 1934 Congress passed the Tydings-McDuffie Act, granting independence to the Philippines and thereby changing the status of Filipinos from U.S. nationals to aliens. This act restricted Filipino immigration to 50 persons a year. When Juan– accompanied by his wife, Sixta–attempted to enter the country through Angel Island, they were detained on the island for a couple days. During this time, they were bombarded with cryptic questions about his whereabouts in the Philippines, intricate details of his children’s lives, and much more. Although their answers were flawless, this interrogation was not enough for the officers at Angel Island. The immigration team went to the trouble of telegraphing the Seattle office to confirm that the Urbanos did, in fact, enter the U.S. through the port of Seattle six years prior. Despite the delay and frustrations, the Urbanos must have felt for simply attempting to return home to their children, Juan did not let that frustration get in the way of his success. During his time in the Philippines, he ran an office called Inventors Service Bureau that served as the country’s first patent service. 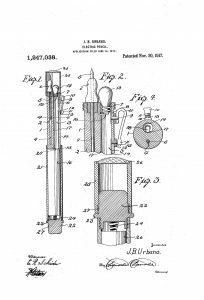 Being an inventor himself, he also established the Pacific Inventors Agency, which made high quality models and blueprints for inventors attempting to obtain patents. Thanks to customers like Ronald E. Clifton, who stated that “by air mail, Juan gets back to you in 2 days vs. central and east coast companies take upwards of 2 weeks,” and the recognition that Juan could make a blue print of the Beverage Lamp that was “much better than [the inventor’s] model,” only proved his success. Juan was able to make about $300 a month through these services. That is $5,135.92 a month and $61,631.04 a year in 2018–well above minimum wage and more than what the majority of high school teachers make today. With his success running high, Juan was forgetting one thing: time. When entering the country in 1937, he was only allowed one year in the United States, so on October 31, 1938, Juan received a letter from the District Director of Immigration. Juan quickly replied with a plea to stay. He stated that he “loves the people and government very much [in the United States].” Luckily, his patriotic oath and success in his business won him an extension. However, that was all it was: an extension. No matter how hard he tried, that was all Juan could get: extensions. He would make up countless excuses on why he needed to stay only 6 more months and then six more months, and then six more months again. These back-and-forth battles with the U.S. Department of Labor forced Juan to apply for a total of six extensions over the span of one year (1938-1939). Although many of Juan’s excuses did hold validity–his children were in school, he had to liquidate his company before leaving, etc.– there was one reason that was the most powerful–his wife Sixta had become immensely ill. After getting checked out by a doctor, it was found that she had advanced myocardial degeneration and very high blood pressure. She was in no condition to accompany Juan back to the Philippines or to stay in San Francisco and look after herself. She needed him, which meant he needed her too. Although it was only written on paper, over time, Juan’s resilience started to dim. With every one of his applications to stay in the U.S., Juan became less motivated. In the beginning, he would cram two lines of eloquent persuasion into the box titled, “why do you want to stay in the United States of America?” Now he could barely scratch out the line that Sixta was ill. It is possible that the countless denials of full residency with his family over and over again discouraged him from even trying. When Sixta passed away, not only did he lose her, but Juan also lost his business. The Pacific Inventors Agency had dropped in profit by 50%, now earning him only $150 a month. Still desperate to stay for the sake of his children, Juan even had the priest who buried his wife vouch for him. He stated that Juan’s “circumstance is more than unfortunate.” The priest believed he was once well off, but he had lost his money, and “it is almost impossible [for Juan to move back to the Philippines] financially. He still has obligations of debt here.” Unfortunately, not even a man of god had influence enough to win Juan a stay in the United States. His final application was firmly and finally denied, and Juan was deported on August 11, 1939, via the S.S. President Pierce. He was deported from what he thought was his home country to what he was told was his home country. Source of images: Case File for Sixto and Juan Urbano, National Archives and Records Administration, San Bruno, CA. Miho Carey wrote this during an “externship” at AIISF in 2018 when she was a first-year college student at Yale University. Special thanks to Judy Yung for editing assistance.